I host monthly networking meetings for women who are running their own businesses, or are dreaming of doing so. They are a chance to meet other like-minded people, share problems, get inspired by each other, and share advice we have each learned along the way. We have women who are at the dreaming stage, and women who are well on their way. We tend to eat cake and drink wine. Meeting number three was yesterday (you can read about meeting one and two here), and as per usual we started with cake! We had the pleasure of using a fabulous mix of vintage plates, and had way too many cakes (not possible surely?!). 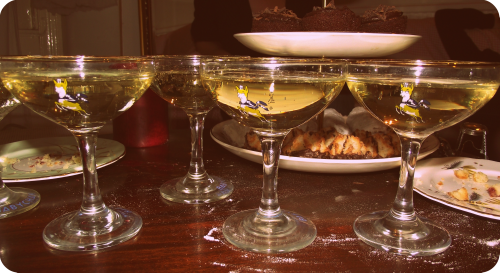 We also enjoyed some bubbly in vintage babycham glasses. We start the meetings with a round robin of introductions, where we explain what we do/who we are, and update the group with anything we have achieved since the last meeting. We had hoped to have two special guests, but unfortunately one was too swamped with her business needs. We were still left with a great guest - a specialist in social media. We discussed the use of Twitter and facebook, and what we should give to them and expect from them. We also talked about LinkedIn, viral videos, Hootsuite, GroupOn, and how to fuse the personal and professional sides of your social networking identities. I think we all gained a lot from hearing our guest speak, and most of us set ourselves goals linked to this discussion. We already have a Wonderful Women Twitter list but we now have our own hash tag #wwmoob which enables us to find each other's tweets that may be relevant to each other. As per usual, there was some dressing up. We all left the meeting after setting a goal for the next meeting.